Granville T. Woods patented an electric railway system. B. Jekhovsky discovered asteroid #988 Appella. Igor Dmitrievich Novikov (10 November 1935 - ) is a Russian theoretical astrophysicist and cosmologist. He formulated the Novikov self-consistency principle in the mid-1980s, an important contribution to the theory of time travel. Novikov gained his Ph.D in astrophysics in 1965 and Doctoral Degree in astrophysics in 1970. From 1974 to 1990 he was head of the Department of Relativistic Astrophysics at the Space Research Institute in Moscow. Before 1991 he was head of the Department of Theoretical Astrophyics at the Lebedev Physical Institute in Moscow and has been a professor at Moscow State University. Since 1994 he has been director of the Theoretical Astrophysics Center (TAC) of the University of Copenhagen, Denmark. He is currently also a professor of astrophysics at the Observatory of the University of Copenhagen, where he has been since 1991. He was elected a Fellow of the Royal Astronomical Society in 1998. Direct-dial coast-to-coast telephone service began in the United States. Direct-dial, coast-to-coast telephone service was launched on 10 November 1951 when Mayor M. Leslie Denning of Englewood, New Jersey, picked up his phone handset and called his counterpart in Alameda, California, Mayor Frank Osborne. Automatic completion of the call was accomplished in 18 seconds. The 10-digit North American Numbering Plan for area codes was also introduced at the same time. NASA's Lunar Orbiter 2 entered orbit around the Moon. NASA Surveyor 6 landed on the Moon in Sinus Medii, where it later made a short hop and became the first human craft to take off from the Moon. NASA's Surveyor 6 mission was launched on 7 November 1967. It made a soft landing on the Moon on 10 November at 0101:06 UT, at Latitude 0.46 N, Longitude 358.63 E in Sinus Medii, photographed the Lunar surface, sampled Lunar soil, and used its propulsion system to briefly lift off of the Lunar surface. Surveyor 6 was the fourth of the Surveyor series to successfully achieve a soft landing on the Moon. 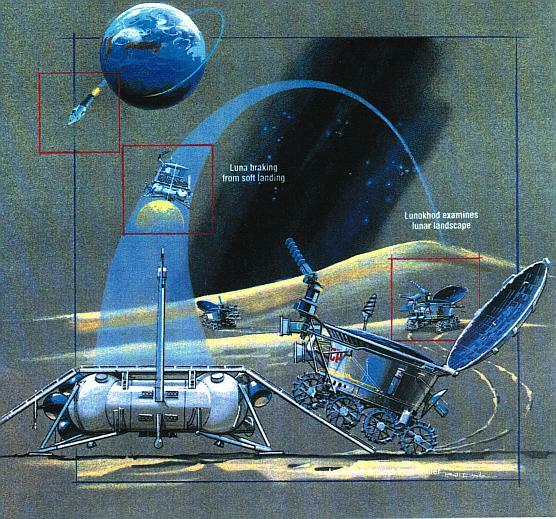 The primary objectives of the Surveyor program, a series of seven robotic Lunar soft landing flights, were to support the coming crewed Apollo landings by: (1) developing and validating the technology for landing softly on the Moon; (2) providing data on the compatibility of the Apollo design with conditions encountered on the Lunar surface; and (3) adding to the scientific knowledge of the Moon. The specific primary objectives for this mission were to perform a soft landing on the Moon in the Sinus Medii region and obtain postlanding television pictures of the Lunar surface. The secondary objectives were to determine the relative abundance of the chemical elements in the Lunar soil by operation of the alpha-scattering instrument, obtain touchdown dynamics data, obtain thermal and radar reflectivity data, and conduct a vernier-engine erosion experiment. The basic Surveyor spacecraft structure consisted of a tripod of thin-walled aluminum tubing and interconnecting braces providing mounting surfaces and attachments for the power, communications, propulsion, flight control, and payload systems. A central mast extended about one meter above the apex of the tripod. Three hinged landing legs were attached to the lower corners of the structure. The legs held shock absorbers, crushable, honeycomb aluminum blocks, and the deployment locking mechanism and terminated in footpads with crushable bottoms. The three footpads extended out 4.3 meters from the center of the Surveyor. The spacecraft was about 3 meters tall. The legs folded to fit into a nose shroud for launch. A 0.855 square meter array of 792 solar cells was mounted on a positioner on top of the mast and generated up to 85 Watts of power which was stored in rechargeable silver-zinc batteries. Communications were achieved via a movable large planar array high gain antenna mounted near the top of the central mast to transmit television images, two omnidirectional conical antennas mounted on the ends of folding booms for uplink and downlink, two receivers and two transmitters. Thermal control was achieved by a combination of white paint, high IR-emittance thermal finish, and a polished aluminum underside. Two thermally controlled compartments, equipped with superinsulating blankets, conductive heat paths, thermal switches and small electric heaters, were mounted on the spacecraft structure. One compartment, held at 5-50 degrees C, housed the communications and power supply electronics. The other, held between -20 and 50 degrees C, housed the command and signal processing components. The TV survey camera was mounted near the top of the tripod. Strain gauges, temperature sensors, and other engineering instruments were incorporated throughout the spacecraft. One photometric target was mounted near the end of a landing leg and one on a short boom extending from the bottom of the structure. A Sun sensor, Canopus tracker and rate gyros on three axes provided attitude knowledge. Propulsion and attitude control were provided by cold-gas (nitrogen) attitude control jets during cruise phases, three throttlable vernier rocket engines during powered phases, including the landing, and the solid-propellant retrorocket engine during terminal descent. The retrorocket was a spherical steel case mounted in the bottom center of the spacecraft. The vernier engines used monomethyl hydrazine hydrate fuel and MON-10 (90% N2O2, 10% NO) oxidizer. Each thrust chamber could produce 130-460 N of thrust on command, one engine could swivel for roll control. The fuel was stored in spherical tanks mounted to the tripod structure. For the landing sequence, an altitude marking radar initiated the firing of the main retrorocket for primary braking. After firing was complete, the retrorocket and radar were jettisoned and the doppler and altimeter radars were activated. These provided information to the autopilot which controlled the vernier propulsion system to touchdown. With a payload virtually identical to that of Surveyor 5, this spacecraft carried a television survey camera, a small bar magnet attached to one footpad to detect magnetic material, an alpha-scattering instrument to study surface composition, and convex auxilliary mirrors mounted on the frame to view the surface under the spacecraft, as well as the necessary engineering equipment. The main differences were that Surveyor 6 had polarizing filters on the TV camera, a different type of glare hood, and had 3 auxilliary mirrors instead of 2. Surveyor 6 had a mass of 1006 kg at launch and 299.6 kg on landing. Surveyor 6 was launched 7 November 1967 from launch complex 36B of the Eastern Test range at Cape Kennedy, Florida. The Atlas-Centaur booster put the spacecraft into an initial Earth parking orbit from which it was injected into a Lunar-transfer trajectory at 8:03:30 UT. A midcourse correction manuever was performed at 2:20:00 UT on 8 November 1967. Surveyor 6 touched down on the Lunar surface on 10 November 1967 at 01:01:06 UT (8:01:06 EST 9 November) in Sinus Medii, a flat, heavily cratered mare region, at 0.49 N, 358.60 E (selenographic), the center of the Moon's visible hemisphere. At 10:32 UT on 17 November 1967, the vernier engines were fired for 2.5 seconds, causing Surveyor to lift off the Lunar surface 3 to 4 meters and land about 2.4 meters west of its original position. This Lunar "hop" represented the first powered takeoff from the Lunar surface, and furnished new information on the effects of firing rocket engines on the Moon, allowed viewing of the original landing site, and provided a baseline for stereoscopic viewing and photogrammetric mapping of the surrounding terrain. The mission transmitted images until a few hours after sunset on 24 November, returning a total of 29,952 images. The alpha-scattering experiment acquired 30 hours of data on the surface material. The spacecraft was placed into hibernation for the Lunar night on 26 November. Contact with the spacecraft was resumed on 14 December for a short period, but no useful data were returned and the last transmission was received at 19:14 UT on 14 December 1967. The results of the experiments showed that the surface had a basaltic composition, similar to that found at the Surveyor 5 landing site. Engineering and soil mechanics data indicated the bearing strength of the surface was more than adequate to support human landings. This spacecraft accomplished all planned objectives. The successful completion of this mission also satisfied the Surveyor program's obligation to the Apollo project. A Thor Delta launched from Vandenberg, California, carried the ESSA 6 (TOS-D) satellite into polar orbit, which returned cloud cover images. ESSA 6, launched 10 November 1967, was a Sun-synchronous operational meteorological satellite designed to provide real-time Earth cloud cover TV pictures to properly equipped ground receiving stations for use in weather analysis and forecasting. The satellite had essentially the same configuration as that of a TIROS spacecraft, i.e., an 18-sided right prism, 107 cm across opposite corners and 56 cm high, with a reinforced baseplate carrying most of the subsystems and a cover assembly (hat). Electrical power was provided by approximately 10,000 1- by 2-cm colar cells that were mounted on the cover assembly and by 21 nickel-cadmium batteries. Two redundant wide-angle Automatic Picture Transmission (APT) cameras were mounted on opposite sides of the spacecraft, with their optical axes perpendicular to the spin axis. Projecting downward from the baseplate were a pair of crossed-dipole command reception antennas. A monopole telemetry (136.500 MHz) and tracking (136.770 MHz) antenna extended outward from the top of the cover assembly. The satellite spin rate was controlled by means of a Magnetic Attitude Spin Coil (MASC), with the spin axis maintained normal to the orbital plane (cartwheel orbit mode) to within plus or minus 1 deg. The MASC was a current-carrying coil mounted in the cover assembly. The magnetic field induced by the current interacted with the Earth's magnetic field to provide the torque necessary to maintain a desired spin rate of 10.9 rpm. The satellite performed normally after lanuch. The APT system was turned operationally off on 25 July 1969, and reactivated on 11 September 1969. The spacecraft was deactivated on 4 November 1969. USSR launched Zond 6 on a Lunar flyby mission. USSR launched Luna 17 carrying Lunokhod 1, the first (robotic) Lunar rover. The Canadian Anik 1 commsat was launched from Cape Canaveral, Florida, positioned in geosynchronous orbit over the Americas at 114 deg W 1973-1976; at 104 deg W 1976-1982. Anik 1 (Anik A, Telesat 1, Telesat-A) was a Canadian telecommunications satellite launched into geostationary orbit on 10 November 1972 with an anticipated life of seven years. It was about 1.83 meters in diameter, 3.35 meters high, and weighed 1240.59 lb. The satellite communication system provided 12 C-band channels, two of which were protection channels for the ten traffic carrying channels. Uplink transmission was in the 5.925-6.425 GHz band, and the down link operated in three 3.7-4.2 GHz bands. Telemetry, tracking, and command functions required for satellite stationkeeping and positioning were also provided in those frequency bands. The satellite acted as a space repeater capable of receiving transmissions from Earth stations and retransmitting them to other Earth stations in Canada. The antenna coverage provided the capability of serving virtually all of Canada. The RF channels were each capable of transmitting a color television signal or up to 900 one-way voice channels. Purple Mountain Observatory discovered asteroid #3613. An Ariane 3 launched from Kourou carried the US Spacenet F2 and European MARECS 2 communications satellites into space, which were initially positioned in geosynchronous orbit at 69 deg W and 177 deg E, respectively. The first OK-GLI Buran analog flight was made from the Zhukovskiy test flight center near Moscow, used to duplicate the anticipated Buran (Soviet space plane) handling and test systems software. On a space walk from Mir, cosmonauts Padalka and Avdeyev hand-launched the Sputnik-41 amateur radio mini-satellite. Sputnik-41, also designated RS-18, was another scale model of Sputnik 1, which was launched over 41 years earlier. On a space walk from Mir on 10 November 1998, Padalka and Avdeyev hand-launched the Sputnik-41 amateur radio mini-satellite, which had been brought to space from Baikonur aboard Progress M-40 on 25 October 1998. Sputnik-41, also designated RS-18, was another scale model of the first satellite, Sputnik 1, launched a bit more than 41 earlier. It carried a small transmitter, and was sponsored by Aero Club de France, AMSAT-France, and the Astronautical Federation of Russia. A similar model was launched in 1997 for the fortieth anniversary of Sputnik. On that occasion, two flight models were carried to Mir but only one was launched. The second Sputnik-40 flight model was still aboard Mir as of 1998. At the time, it was felt the second Sputnik-40 would perhaps be deployed prior to the abandonment of Mir in 1999. The US Air Force launched Navstar 49 (USA 154) from Cape Canaveral, Florida, a GPS Block 2R satellite component of the Global Positioning System, placed in Plane F Slot 1 of the constellation. Russia's Soyuz TM-34 landed in Kazakstan, returning the EP-4 visiting crew of three astronauts to Earth from their ten day stay at the International Space Station (ISS). The next transit of Earth across the Sun, as seen from Mars, will be visible to Mars residents.